1. Mix all the marinade ingredients in the shallow bowl and marinade chicken breasts at least 30 minutes up to 3 hours. 2. Grill chicken until done about 8-10 minutes each side or put in the preheated oven (350 F / 177 C) for 20 - 25 minutes. 3. Meanwhile, cook the rice noodle and set aside. 4. Rest chicken for 5 minutes and slice. 5. Divide noodle into 4 portions. 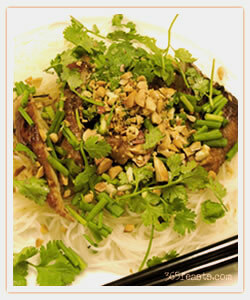 On each noodle, put chicken and corander leaves, mint leaves and chives as much as you want. Add 1 tablespoon of roasted peanut on top.